It was Sunday afternoon and I felt like snacking on something. I couldn't decide if I wanted sweet or savory so I settled on marrying two flavors in one empanada! 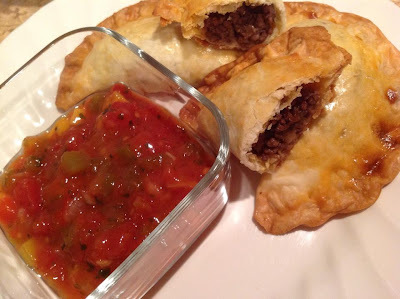 Empanadas can come with a variety of fillings, it just take a little creativity. Instead of making the dough from scratch, I opted for store bought discs to save time. I like the Goya brand because it gives perfect results every time. This recipe shows how fruit can be incorporated. As always, I have to stay true to my Caribbean roots. I added an ingredient which brings back fond childhood memories. Can you tell what it is? In a large pan, heat oil and butter. Add onions, then sugar and sauté until onion is light brown. Pour in wine and add guava. Spread empanada discs on a flat surface and place 2 tsps of filling in the center of the disc. This recipe yields 20 empanadas. This seems like it would require a lot of skill but looks so tasty.